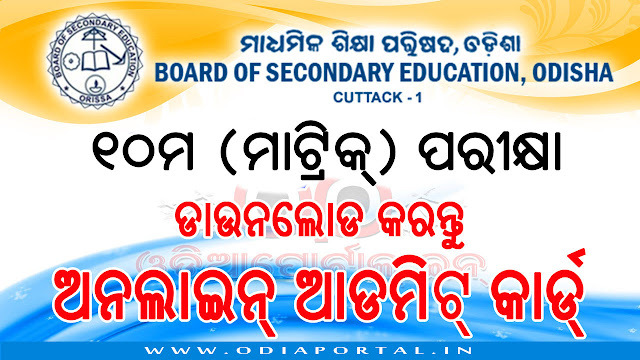 Board of Secondary Education (BSE), Odisha is going to conduct annual 10th Matric examination from February 23, 2019. Candidates can download their Online Admit Cards below. Click on Below Button "Download HSC Admit Card 2019"
Enter your school Code (Ex: 111CA) and password to login. After successful validation of credentials you will be able to see admit cards of Students from Roll no 1 to rest. Now click on "Download PDF" to save entire admit card PDFs to your Computer or vice versa. (I) On the first day of the examination, rooms/ halls shall be opened 01 hour before the beginning of the examination and 40 minutes before on other days. (ii) A candidate coming 30 minutes late after the commencement of the examination will not be admitted to take the examination. (iii) The candidate should not bring any material other than the admit card supplied by BSE, pen, pencil and geometry box to the examination hall. (Iv) A candidate should not misbehave with the Centre supdt. /Deputy centre supdt., Observer, Invigilators, Squad members and other Candidates. (v) All candidates are subject to frisking at the entrance as well as inside the examination hall whenever required. (i) A candidate is not allowed to leave the hall before an hour after the examination starts. A candidate can be permitted by the invigilator to leave the hall temporarily after an hour on emergency ground. But before leaving the hall he/she must deposit the question paper and answer book with the Invigilator. (II) Candidates should not leave their seats finally until they submit answer books to the Invigilator. (Ill) No candidate will be allowed to re-enter the examination hall once he/she has left the hall after finally handing over the answer book. (Iv) If any candidate submit the Answer Book before the examination hall once he/she has to deposit the question paper to the invigilator. (v) Candidates are not allowed to talk to each other In the examination hall. (vi) No one should receive help from or assist any other In the examination hall In any manner. (vii) The candidate should not write any thing except his/her Roll Number on the question papers. (viii} The candidates should not tear or mutilate the OMR Answer Sheet or Answer Book or the question paper. (ix) The candidate should neither possess nor use any incriminating materials in the examination hall. (x) OMR Answer Sheets will be distributed 30 minutes and the Question Papers will be distributed 15 minutes before the commencement of the examination only for the purpose of reading the question. The candidates are to return OMR Answer Sheet when instructed and answer book at the end of the examination. (xi) Completely darken the circle In the OMR Answer Sheet. Partial darkening of the circle will fetch no mark for that particular question. (xii) Set code should be properly mentioned. Set code cannot be changed at the later stage. (xiii) Use of mobile phone Is not allowed Inside the examination centre. As per the instructions printed in the Answer Book. Infringement by a candidate of any of the above Instructions/rules renders him/her liable to expulsion from the examination hall and such further penalties as the Board of Secondary Education may deem flt to Impose Including debarring him/her from subsequent examination(s) and Initiating criminal prosecutions.